Saw this Surf Green 1954 Chevrolet Bel Air a few Sundays ago on my way to a car show in Wheatfield. This thing looks brand new, and the few custom touches added on don’t detract from its appearance at all. I’m especially fond of the Blue-Dot taillight lenses; I wish they made them for today’s cars! 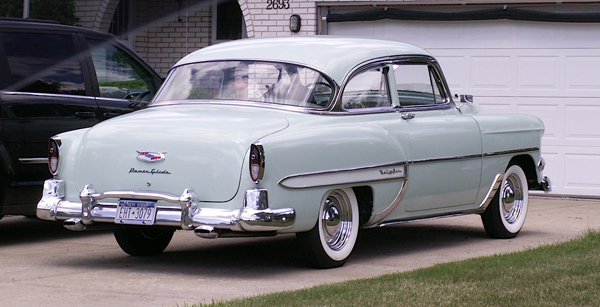 This two-door sedan is from back in the day when automatic transmissions were something to brag about — hence the Power Glide badge on the trunk lid. Found this beauty right around the Wheatfield-North Tonawnda line. Jim Corbran, RRofWNY Check out our new Facebook page: LuvTheCheapies The post RealRides of WNY appeared first on Buffalo Cars.